Happy New Year and welcome back to the Girlfriends Cyber Circuit! 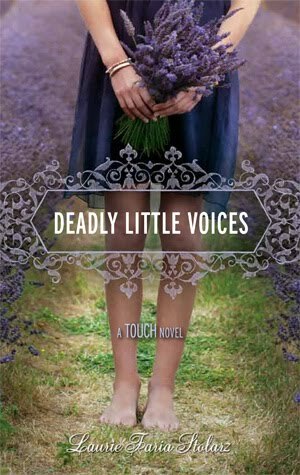 This week's guest is Laurie Faria Stolarz, author of DEADLY LITTLE VOICES, which was just released from Disney/Hyperion Books for Children. Look at that gorgeous cover! Deadly Little Voices is the third in Laurie's popular TOUCH series, which began with Deadly Little Secret in December 2008. Camelia Hammond thought her powers of psychometry gave her only the ability to sense the future through touch. But now she’s started to hear voices. Cruel voices. Berating her, telling her how ugly she is, that she has no talent, and that she'd be better off dead. Camelia is terrified for her mental stability, especially since her deranged aunt with a suicidal history, has just moved into the house. As if all of that weren't torturing enough, Camelia's ex-boyfriend, Ben, for whom she still harbors feelings and who has similar psychometric abilities, has started seeing someone else. Even her closest friends, Kimmie and Wes, are unsure how to handle her erratic behavior. With the line between reality and dream consistently blurred, Camelia turns to pottery to get a grip on her emotions. She begins sculpting a figure skater, only to receive frightening premonitions that someone's in danger. But who is the intended victim? And how can Camelia help that person when she’s on the brink of losing her own sanity? “You’re just one big fat joke,” the voice hisses. I cover my ears, but the insults keep coming. “Just do it,” a voice whispers. It’s followed by more voices, of different people. They talk over each other and mingle together, producing one clear cut message – that I’m a waste of a life. I rock back and forth, trying to remain in control. I smother my ears with the sheet. Press my forehead against my knees. Pound my heels into the floor, bracing myself for what comes next. Meanwhile, there’s a drilling sensation inside my head; it pushes through the bones of my skull, and makes me think that I’m going crazy. “Please,” I whisper. More tears sting my eyes. I shake my head, wondering if maybe I’m already dead, if maybe the voices are part of hell. “In keeping with Touch series tradition, in celebration of the release of DEADLY LITTLE VOICES, I’m launching my annual “winner-gets-to-have-a-minor-character-named-after-him/her” contest! The grand prize winner will get to have a minor character in DEADLY LITTLE LESSONS, the fifth and final book in the TOUCH series named after him or her. Other prizes include autographed book copies and the opportunity to have original work appear on my web site, Facebook, and Twitter pages. OFFICIAL RULES and GUIDELINES for this contest are on my website, under NEWS. ALL ENTRANTS MUST SIGN A RELEASE FORM." 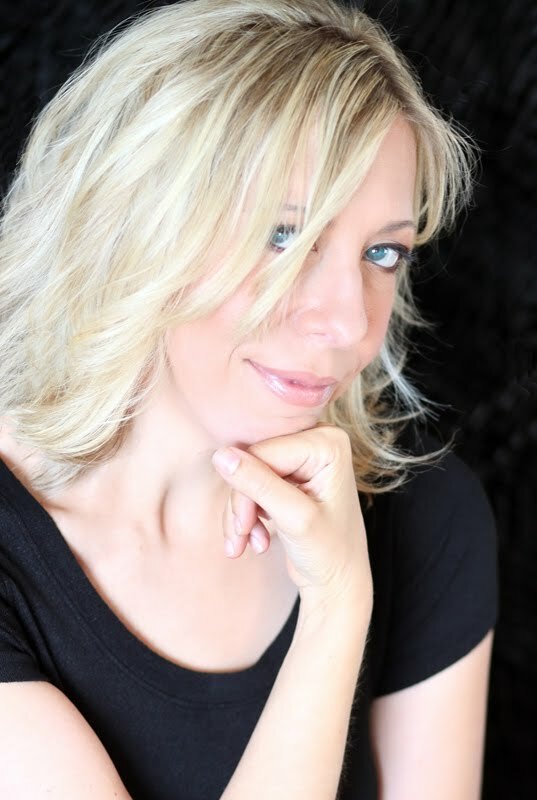 Sign up for Laurie's e-Newsletter for updates on contest, book, and appearance info. Laurie Faria Stolarz is the author of Deadly Little Secret, Deadly Little Lies, Deadly Little Games, Deadly Little Voices, Project 17, and Bleed, as well as the bestselling Blue is for Nightmares series. Born and raised in Salem, Massachusetts, Stolarz attended Merrimack College and received an MFA in creative writing from Emerson College in Boston. For more information, please visit her Web site at www.lauriestolarz.com. Favorite snack: Popcorn with soy butter and lemon/pepper seasoning. Fashion addiction (at the moment): artfully torn jeans, tall boots, pretty scarves, and Michael Stars tees. Dessert: Dark chocolate in almost any form - the darker the better. Fast food: French fries at least once every few months (with lots of ketchup). Beauty Binge: Aveda haircare products, which includes indulging in high-and/or-low-lights every eight weeks. Also, Caudalie skincare, Ineke perfume (Field Notes from Paris), Revitalash mascara, and Buxom Lips from Bare Escentuals. Late-Night TV: Real Housewives of (wherever), Mad Fashion, Fashion Hunters. Chick Flick: Never Been Kissed, How to Lose a Guy in 10 Days, Juno, Green Card, Once, The Devil Wears Prada, Bridget Jones Diary, Thelma & Louise, Mean Girls, Moonstruck, Clueless, Under the Tuscan Sun, and anything with John Cusack. Nightlife: Pilates in front of the TV (a regular occurrence), answering e-mail (also regular), and dinner and/or a movie out with friends (happens far too rarely). Cheap Thrill: Window-shopping, tabloid magazines, buying a new lip gloss, a tall cup of coffee from Peet's or Starbucks. Ultimate Splurge: G2O Day Spa for a massage. Favorite Quote: Perseverance is key. Favorite cuisine: Indian food – onion chutney, curried vegetables, and kashmir bread. I also love cheeseless pizza from Bertucci's. Interests: Vegetarian cooking, holistic nutrition, aromatherapy. Favorite Music: Adele, Fergie, James Blunt, Gavin Rossdale, Tori Amos, Sting, Sarah McLachlan, Gwen Stefani, Black-eyed Peas. Hobbies: Walking, napping, cooking, shopping, interior decorating. Congrats to Laurie on her new release, and hope everyone has a wonderful New Year full of great books like this! I haven't read any of the Touch books, but this sounds really intense! I'll have to check it out. How do I get an ARC of SHINE?